Here’s an article at the Atlantic that caught my eye: What Is Jogging Doing to Your Dog? It’s tough to keep teenage Goldens and German Shorthaired Pointers exercised. I know that. But this article is completely correct about the importance of keeping a careful eye on your dog if you take him biking or jogging. Make this a mantra: If you feel hot, your dog feels hotter. If you feel overly hot, your dog may be in danger of heatstroke. If you take your dog out in the summer, take lots of water for him. And step in if your dog doesn’t have common sense. I had to stop Dora from chasing dragonflies once. She was obsessed, but it was really hot that day. I made her come in after half an hour. In the summer, I touch the surface of any blacktop before letting my dogs step on it. It’s easier for me to carry a dog across a parking lot than it would be for someone with a Great Dane, but if you have a big dog, you may need to go around black surfaces. A friend of mine had a dog burn all four feet on a parking lot once. Watching a dog try to limp on all four feet at once will permanently sensitize you to this issue. Jogging on hard surfaces can damage a dog’s joints. Especially if you go on and on and don’t stop. Lots of dogs will try really hard to keep up with you even if they’re in pain, and of course repetitive stress injuries may not cause enough pain to make them want to stop — until it’s too late. Exercising your dog is great, but please be careful.
. . . Also. Let me just add, although you may not have an experienced, knowledgeable breeder handy, if you do, it doesn’t hurt to have someone like that stack up your dog and take a look at his structure before you start jogging with him. I really hate watching a dog run past me or jump up on and down off of the rocks at Pickle Springs (a rough hiking trail) when its structure plainly predisposes it to serious injury. This dog has very poor angulation behind. 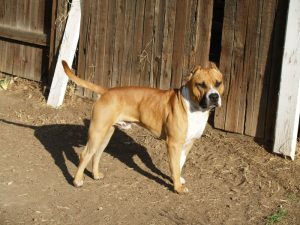 I’m afraid it would be liable to serious injury if its owner took it jogging or hiking very often or for long distances. 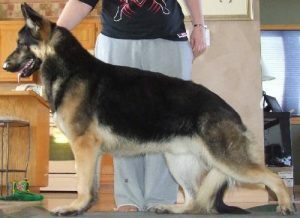 This otherwise nice German Shepherd has weak front pasterns. Jumping down off anything is liable to lead to eventual breakdown of the joints. A smaller dog with such poor front pasterns would probably eventually break down in the front just from jumping off the couch. The point of good structure is not just bragging rights in the show ring. Structurally poor dogs are unsound and are likely to experience physical breakdowns as they get older. Your vet is not likely to know much about soundness and structure. Veterinarians concentrate on accidents, injuries, and diseases, and don’t (generally) focus at all on structural soundness. Pat Hastings’ book, Structure in Action, offers a pretty good look at the functional consequences of poor structure. An Eye for a Dog by Robert Cole is my favorite book about canine structure.